It’s that time of year again; the weather gets crisper, the kids go back to school and The Second City, that stalwart institution of comedy, debuts its annual Fall Mainstage revue. This newest edition is called Rebel Without a Cosmos. 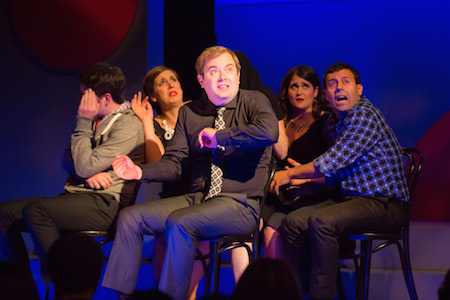 The Second City’s Mainstage revues rely on a tried-and-true formula. It’s strictly middle brow humour; topical without being specifically timely, satirical but never incredibly biting or edgy (beyond dropping an occasional F-bomb) and safe enough for corporate hospitality groups and tourist bus tours. So, what’s new with this edition? The recent revival of the popular science TV show Cosmos provides a thematic backdrop for a show that also skewers the social media-obsessed “selfie” generation where everybody sees themselves as the centre of the universe. As usual, we have a cast of plucky, fresh-faced, young comics; Ashley Botting, Sarah Hillier, Etan Muskat, Allison Price, Connor Thompson, and Kevin Whalen, performing a couple dozen sketches covering topics ranging from Apple to yoga classes to the book Eat, Pray, Love and sprinkled with local Toronto references galore. There are wobbles here and there; a sketch featuring a screaming couple on the verge of divorce has an odd, uncomfortable tone, a ballad to Canadian astronaut Chris Hadfield is a promising concept that doesn’t quite hit the mark, and a sketch about a stoner trying to vote has bit of a muddled through-line that doesn’t entirely make sense. But aside from those few missteps Rebel Without a Cosmos really delivers the goods. The show is mostly scripted but some of the best, edge-of-your-seat, spontaneous laughs come from an improvisational scene featuring an audience “volunteer” cast into a role in a ‘50s sci-fi action movie spoof. It’s thrilling to watch the cast members and audience volunteer react and think on their feet. Rebel Without a Cosmos is at its best when it focuses on short, punchy humour. The sketch where Ashley Botting gives an acceptance speech after winning a “Miss Average Canada” award is a delightful, beautifully written nugget of observational humour and a sketch about taking selfies at the most inopportune time had me literally roaring with laughter. Standout performances include Connor Thompson’s “Oiley Pete” with his amazing deadpan, fast-paced execution of long runs of lines from memory, and Sarah Hillier’s hilariously over-the-top cross-dressing turn as a grizzled small-town police chief displaced to the city of Toronto. With Second City Revues you pretty much know what you’re gonna get; a fun night out with friends, some drinks and hopefully a few belly-laughs depending on your taste in comedy, and Rebel Without a Cosmos pretty much delivers. Tickets $25.00 to $52.00, Dinner and Show packages available. Student Tickets $14-$18 (not available for Saturday 7:30pm performances).